It is wonderful to see cottage industries supplying farmer markets and a insurgence of small local business producing products that can't be easily found in a supermarket (or taste nothing like they should in the supermarket). However we shouldn't fall into the trap of thinking just because it was eaten in times passed that it is nutritious. Not all heritage foods are nutritious! 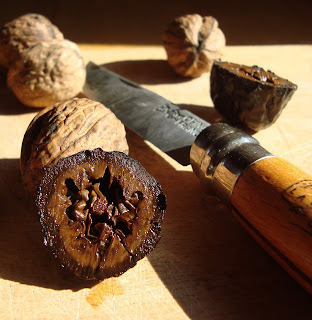 This post is about my experiment with pickled walnuts. They are a traditional English food, and I have been trying to make them for years. However you only have a small window of opportunity, between when the walnuts are reasonable size, and when the shell starts to toughen up. If you can't poke a needle through them, they have gone "passed it" when it comes to pickling them. I normally only see walnuts in late spring/early summer by which time they are to hard. This year while out walking I went past a walnut tree, noticed the fruit and to my delight they were still soft on the inside. I followed a combination of two recipes (A and B). You first have to get the high tannins out (like acorns, and why you can make wine from the young walnuts leaves). You do this by soaking them in salty water for 10 -14 days. Then you dry / blacken them in the sunlight. After this you pickle them like you would any other vegetable. Opened my mine the other day - it is still early days and they need a few more weeks in the pickling solution before they are pickled through, and like a few months until they are in their prime. However I was struck by the fact I was eating a mushy olive, without any of the nutrition of an olive. They are black, quite processed and I am not sure if they have any real nutrition left. The only thing could be some omega 3's or 6's that are found in the walnuts. However I am not holding by breath....... conclusion pickled walnuts might be a heritage food but I will not be making them again as it would appear that they are not at all nutritious. Picture credits: Cevenol Kitchen for green walnuts, The Cottage Smallholding for the picture of brined walnuts ready for drying or pickling. A Taste of Sovoie for finished product.